In journalist Charles Rappleye’s hefty biography of Robert Morris, we learn about the rise and fall of one of America’s founding fathers. Morris-a signer of the Declaration of Independence, the Articles of Confederation, and the Constitution-is largely remembered for his financial contributions to the war effort through his shipping and banking company, Willing & Morris. A member of the Pennsylvania Council of Safety and the Continental Congress, Morris used his merchant network to equip the Continental Army with gun powder, weapons, and other supplies. He is also credited with raising the necessary funds that allowed General George Washington to move the army to Yorktown in the fall of 1781. After the war, Morris invested heavy in several ruinous land speculation schemes, resulting in him spending three years in debtor’s prison. He died in the spring of 1806 and is buried at Christ Church in Philadelphia. 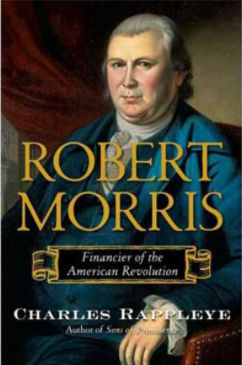 The following excerpt from Robert Morris: Financier of the American Revolution, outlines Morris’ early involvement in the Independence movement-as a member of the Continental Congress and as a contract merchant for the same body.